Support work committed to amplifying marginalized voices in inclusive, equitable processes. Nourish a creative process based on rigorous research and collaboration across disciplines. Bring engaging programs to diverse communities across New York City and beyond. Model and develop green, sustainable theater practices. How your contribution helps . . .
Our beloved eco-playwriting program for Brooklyn fifth-graders. From January-March, students are guided in writing original eco-plays and learning the fundamentals of playwriting and environmental justice. In April, the kids' plays are fully staged, performed by adult artists, and designed using only sustainable materials and efficient instruments. We're in the process of creating a play with music inspired by Pleistocene Park, a real-life experiment involving the resurrection of an Ice Age biome and the Wooly Mammoth for the purposes of curbing the melting of Arctic permafrost. The Fellowship is a six-month paid residency for two individuals to collaboratively create a new performance-based work exploring environmental justice. 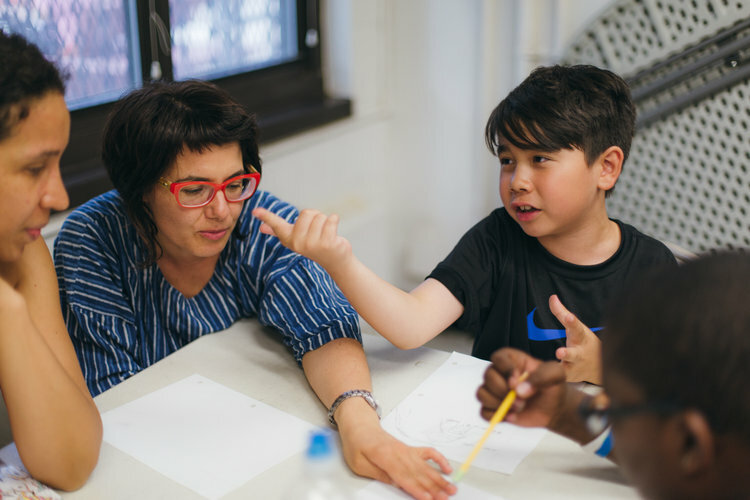 Fellows will spend 10 hours/week developing an original piece, with regular opportunities to share work-in-progress, participate in other programs of Superhero Clubhouse, and engage with our community. The Fellowship will culminate in a presentation for an invited audience. Offering artists the chance to create/develop original eco-theater material with peer support & feedback, form collaborative relationships, as well as share/develop strategies and methodologies for creating eco-theater. If you are an artist, scientist, cultural worker, or organization who is interested in collaborating with us, or have work you think we should be involved in, please reach out. It's always great to meet like-minded partners. We have many ways for you to get involved; volunteering with kids in the classroom for Big Green Theater, working special events, and helping our productions run smoothly. Get in touch with your interests, and we'll find something to fit you. Are you a student or young professional looking to get experience working with an arts organization dedicated to eco-art, sustainable practices, and interdisciplinary collaboration? We offer internships or apprenticeships each semester tailored to your unique interests. We have people from all fields of study in and outside of the arts work with us. Get in touch and tell us a little bit about yourself.